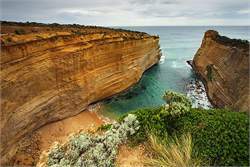 Towards the western end of the Great Ocean Road, Port Campbell is nestled among some of Victoria's most spectacular coastline scenery, including Port Campbell National Park and the Twelve Apostles. Sheltered by cliffs and Norfolk pines, it has the atmosphere of a haven on the edge of wild nature. A colourful and lively seaside village, Port Campbell is home to restaurants and cafés with views of the beach, bakeries selling homemade goodies and vibrant shops and galleries to explore. 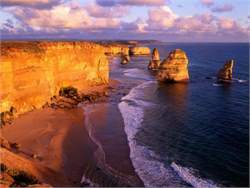 Port Campbell is a great base for seeing the Twelve Apostles, the dramatic rock stacks that have made this coastline famous. Take to the air for a bird's-eye view of the Twelve Apostles, or join a boat tour around them to experience their immense size. 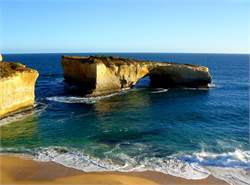 Other stunning coastal features include Loch Ard Gorge, Gibson Steps and the Bay of Islands. Creeks and the harbour offer excellent fishing and Two Mile Bay is revered by surfers as one of the best big-wave breaks in Australia. Join a dive tour and visit large canyons and gorges on the sea floor or a boat tour taking anglers and passengers close to the stacks, caves and arches in the area. Bay of Islands - Witness the spectacle of sunset over the Bay of Islands. 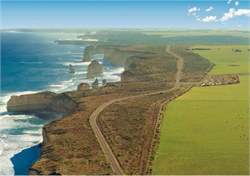 - Scenic flights - Take to the air for a birds-eye view of the Twelve Apostles. Maritime history - Unlock the secrets to the many shipwrecks along the coast. Apostle Plunge - 1.2km ocean swim (part of the Shipwreck Coast Swim Series) held on the Sunday of the Australia Day weekend each year. 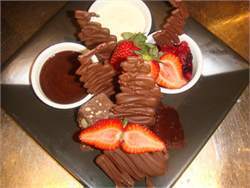 Directions: Port Campbell is 283 kilometres south-west of Melbourne. Travel by car via the Great Ocean Road.